Disclosure: I was sent a screener of this movie in exchange for viewing and sharing my honest thoughts. However, all views shared are mine and mine alone. An exciting film the whole family can enjoy, PUP STAR will release in select US theaters and Digital HD exclusively on Fandango’s premium on-demand video service, FandangoNOW (www.FandangoNOW.com) - August 30, 2016. In Canada, the film will release September 17th exclusively in Cineplex Cinemas as part of the complimentary “Family Favourites Premiere” programming with an additional special movie offer at the Cineplex Stores. Starting today, PUP STAR can be pre-ordered on FandangoNOW for $9.99 at www.fandangonow.com/pupstar. "Welcome to a world where dogs can not only talk -- they can SING! 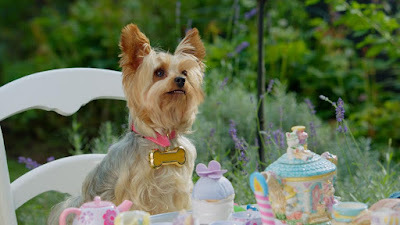 Tiny, a cute little Yorkie pup with a big voice, gets a chance to audition for the singing competition for dogs, “Pup Star.” After she earns a place in the finale, she’s suddenly dog-napped! But with the help of her new friend, Charlie, a retired rock-and-roller, she escapes. Together they leave on an incredible journey through some of music’s most iconic cities. On the way to the competition they meet Big Ears — a soulful Bassett Hound who teaches Tiny to belt out the blues; Murray — a spiritual shaggy dog who helps her find her inner rhythm; and Emily Rose — a country-singing shepherd who helps her learn to sing from her heart. Most important of all, they all encourage Tiny to believe in herself and never give up on her dreams!" The other night we have a fun family movie night. I didn't tell the girls what we would be watching, just that it would be a fun family movie everyone would enjoy. As the girls found their spot on their couch and snuggled in to the watch the movie, I began playing the movie. It only took the opening credits to hear the girls say, "Oh, how cute," "Look at the cute little puppy," "This is going to be a cool movie," and on and on. And, from that point on, the girls were swept away in this fun-filled movie featuring cute and oh so cuddly pups that can talk and sing. Yes, you read that right, singing pups. Think of this movie as American Idol or even the Voice, but with pups doing the singing and judging. At only an hour and 31 minutes in length, this family-friendly movie is great for even the youngest of viewers to sit through from beginning to end and enjoy. As soon as the credits started rolling both of my girls quickly got up and asked when we would watch this movie again. If I let them, they would have watched it again that night. But, we waited until the next day, and after breakfast watched it again. Once you watch this fun family movie you will see why my girls and I can't get enough and could watch this film over and over again. This fun, is not only enjoyable to watch, but like most family-friendly movies, has important life lessons about family, friendship, dreaming big and never giving up, that will spark a discussion between parents and children after the movie is over. I for one give this movie 2 paws up, and know you and your family will love it. And, who knows, maybe you will find yourself singing along with the dogs as you watch this cute family film time and again. PUP STAR is supported by an exciting range of promotional partners including Cold Stone Creamery, Barbara’s Bakery, Eggland’s Best, and Evolution Dog Treats. ..
- Cold Stone Creamery® will offer guests a FandangoNOW Movie Card for a free PUP STAR rental with any purchase, and will support with point-of-sale materials in 1,100 stores nationwide and on email blasts to 2MM My Cold Stone Club™ members. - Barbara’s Bakery will offer a walk-on role for one winner plus their child or dog in the next Air Bud Entertainment movie and other prizing through a special code inside custom Snackimals cereal boxes, featuring Tiny (the singing Yorkie star of PUP STAR! ), and inside custom Puffins cereal boxes. - Eggland’s Best, America’s #1 egg, is egg-cited to launch a nationwide digital campaign supporting PUP STAR, and is the official host of the “Ultimate EB PUP STAR” sweepstakes. The grand prize winner will win a Myrtle Beach, South Carolina family vacation with their own PUP STAR; other prizes include Schwinn SmartStart bicycles, EB Pup Star Prize Packs, and much more! - Evolution Dog Treats will release limited-edition PUP STAR/Evolution Dog Treats -- they’re healthy, delicious treats but they won’t enable dogs to talk and sing like they do in the movie! We so have to see this movie. I know the whole family will enjoy this one we love movies with animals in them.